Popular accommodation option, especially among families and larger groups, villas in Croatia offer ample space, tons of privacy, feeling of luxury, and a great value for money. Because we've recently purchased a villa to rent in Istria, we've thought it's a proper time to cover villas to rent in Croatia here at our blog. There is a large number of holiday villas in Croatia. You'll find many of these villas to rent in scenic countryside, especially in Istria, a northern Adriatic region. However, you can find some villas in the center of towns, and even fewer you'll find at the beachfront, particularly in central and southern Dalmatia. Villas in Croatia differ in style, from rustic charmers, to contemporary villas with clean lines, minimalist furnishing, and floor-to-ceiling windows. Villas for rent in Croatia offer so many advantages over hotels, apartments, or other type of accommodation. They are especially good fit for large families, or group of friends. They come with luxury furnishings, and quality fixtures, as well as with ample amenities. Besides, they are spacious, and they offer safety, privacy, and serenity. Space-wise there aren’t a better accommodation for your holidays in Croatia than villas. They offer lots of space: inside and outside. Majority of Croatian villas to rent are 3-bedroom and 4-bedroom villas. You can expect at least 130 m2 of living space in a 3-star villa; and at least 160 m2 in a 4-star villa. Rooms are spacious, and often come with en-suite bathroom. Outdoor space usually includes covered terraces, and a garden. Many of holiday villas in Croatia also come with a private pool. Found mostly in rural locations, many villas offer tons of privacy. Properties are often surrounded by stone walls and thus, protected from curious views of neighbors and passers-by. So if you feel to stay in your bikini all day long, including a dinner time, it’s your call. Have we already mentioned rural location; kind of away from it all feel that many of these Croatian villas offer?! Yes, majority of Croatia villas are located in quiet villages. Hence, they offer complete tranquility, relaxation, and a peace and quiet. If you feel like having a glass of wine by the pool, at 5 pm, all by yourself, worry not – you won’t be bothered by screaming kids (assuming you can control your own kids) nor hundreds of other guests. Today many villas to rent in Croatia offer more perks than a 5-star hotel. From large flat-screen TV, designer furniture, free WiFi, swimming pool, BBQ facilities, en-suite bathrooms, fully-equipped kitchen, Playstation, trampoline, you name it! In addition, some villas in Croatia even come with indoor swimming pools, sauna, and gym. And the best thing – you never have to wait in line, it’s all yours. With a daily rental somewhere between 320 to 500 € a day, for a 3-bedroom or 4-bedroom villa, villas might seem expensive at first, but don’t forget to count its full capacity, along with a luxury it provides. Villas in Croatia offer the best value for money of all accommodations in Croatia. Consider hotels, for instance. You won't be able to find a double room in a 4-star hotel for less than 250€ in summer. And this is only a double room. If you have two kids, the price goes up, and if you want to book a suite or a proper family room, because your dream holiday doesn't include sharing a room (or worse, sharing a bed) with your teenage kids, prepare to pay as much as 600€ per day (and this if you book early enough to get and early bird discount). OK, you do get three meals a day in this price, and a daily cleaning, but you still need to fight every day with other guests for your place by the pool, or by the sea. When you rent one of luxury villas in Croatia, the pool is all yours. So are the deck chairs. As per law, all villas for rent in Croatia need to be fully-licensed. This means that all Croatia villas to rent are inspected by municipal administration, and rated 3, 4, or 5 stars. In short, higher the star rating, better the quality. Unfortunately, there are still in place two sets of standards for villas in Croatia. Standards that apply to villas built prior to 2007; and more-demanding set of requirements applying to villas built after 2007. This is something to keep in mind when choosing a villa to rent in Croatia. The newer the villa, the higher standards it should meet. Majority of Croatia holiday villas are 3-bedroom and 4-bedroom villas. Minimally required surface for a 3-bedroom villa is 80 m2 for a 3-star villa, and 95 m2 for a 4-star villa. However, majority of 3-bedroom villas has a surface of at least 130 m2. This is where it becomes complicated for villas built after 2007. Basic rule is that a villa needs to have as many full-bathrooms as there are bedrooms (although not specifically en-suite), but villas built after 2007, should also have an additional half-bath. Check prior to your arrival (or even better prior to your booking) if basic supplies, like soap, shampoo, toilet paper, etc. are provided. Although some of them should be mandatory, it doesn't mean they are provided free of charge. Villas in Croatia almost always come with bed linen, and bathroom towels. They are usually provided on arrival for every new guest, and they are usually changed weekly. If you'd like to have fresh bed linen and towels more often, you can request it, but be ready to pay for the service. Kitchen is fully-equipped, and it normally comes with oven, four-ring hob, fridge with a freezer, microwave, filter-coffee machine, toaster, selection of pots, pans, plates, glassware, and utensils. A dishwasher can be less common than other equipment. If it's important for you to have one, double-check when booking. Majority of villas Croatia have an outdoor swimming pool, but it's rarely heated. An indoor pool, while available at some villas in Croatia, is less common, so are sauna, and gym. Lots of luxury villas in Croatia provide basic entertainment for kids like trampoline, a selection of board games, table soccer, game console, and alike. This equipment isn't mandatory, so check before you book. BBQ facilities, outdoor dining area, deck chairs, are all available in majority of villas. Prices for villas in Croatia are calculated per day per villa, regardless of number of people who rent (as long at that number doesn't exceed the maximum occupancy of a villa). Expect to pay around 150€ per day for 3-bedroom villa in a shoulder season, and around 320-400€ a day in high season. A price of rental doesn't always include tourist and registration tax. Tourist tax amounts to approx. 1€ per person per day for everybody above 18 years of age; or 0,5€ per day for teens (12 to 18). A registration tax amounts to 1€ per person per stay. Read the small print when checking prices. Majority of villas have a rural location, a bit away from tourist resorts and the sea. Some are very secluded, while others are set in villages with a restaurant or two. This means you'll need a car to move around. Istria, a northern Adriatic region, has the largest choice of Croatia villas for rent. In the last years Dalmatia is catching up, as well as islands. Due to less number of villas, and a shorter season, villas in Dalmatia and on the islands are usually more expensive than in Istria. Villas keep very strict booking conditions, from late May to mid-September. Minimum stay in a villa is 7 days, with arrival and departure usually on Saturday. Keep this in mind when entering your dates in any booking engine. Unless you choose Saturday-Saturday, you'll have limited number of villas available. You can easily book a villa using Booking.com, AirBnB or Homeaway. Be sure to enter Saturday-Saturday when searching for a villa on these sites. There are also a couple of specialized villa-booking websites in Croatia. The most popular are MyIstria, Istria-Home, and Luxury Croatian Villas that's run by Alan Mandic of Secret Dalmatia (we love their blog!). In a low season you can try to bargain as much as possible, as offer is abundant, and demand is very low. With plenty of sunshine in Croatia, and a private pool at your disposal, sun screan isn't only handy to have, it's a necessity. Whether you decide to spend a day by the pool, or to plunge into deep blue Adriatic, swimming-suit is a must-have for your villa stay. I get my trunks just about anywhere, while Vera wears Shoshanna bikini. More info on Shoshanna swimwear you can find here. We always like to emphasize to our readers that if they like a filter coffee, or a specialty coffee, or just any good Italian coffee, to bring it with them. Supermarkets here mainly carry Croatian coffee brands, very few filter coffees, and if they do offer international brands they are way too expensive. The other day I miscalculated a quantity of coffee I needed while on vacation in Komarna. After I ran out of a Lavazza I had bought in Trieste for a 2€ a pack (250 g), I had two choices: buy Croatian brands like Frank or Barcafe for 3€, none of which I am crazy about; or buy Italian coffee Illy (the only Italian brand I could find in the store here) for 11€ a pack. You see what I'm talking about?! Check here for more information and latest prices. Similar to coffee situation, just a bit worse :), real teas are hard to find in Croatian supermarkets, choice is limited, and prices are higher than back home. If it doesn't take lots of space, better bring your favorite brand with you. When we travel, we take tons of photos. But camera equipment can take lots of space. Recently we've switched from DSLR to mirror-less camera. We've changed our Canon T3i for Panasonic Lumix GX85, and the load just became much lighter. Don't forget your camera when traveling. Water shoes come handy if you plan to spend some time on Croatian beaches. Beaches here are mainly pebbly, or rocky. It's just easier to walk wearing a pair of water shoes. You can buy them here, at many stores along a beach, or you can check these awesome Crocs Vera's using (for a beach and a work respectfully). I don't know about you, but we both read a lot, and even more so when on holidays. For me there is nothing as relaxing as reading a book while lounging by the sea or a pool. A glass of wine in hand, bien sûr! Check here for latest prices on e-readers. Mosquitoes are plentiful in Croatia, and even more so in rural locations where majority of villas is located. Our house to rent has mosquito nets on all windows and doors, but this isn’t always the case. Bring a mosquito repellent with you to be on a safe side. Croatia uses 220V, 50 Hz frequency, and type C & F plugs. Both are similar plugs with two round prongs with 19 mm between the two. Villas in Istria are plentiful. Even we have a villa to rent in Istria. Majority of villas in Istria are set in the countryside, particularly in villages around Porec, Vizinada, and Pula. They usually feature an outdoor swimming pool, so the distance to the sea isn't that important. 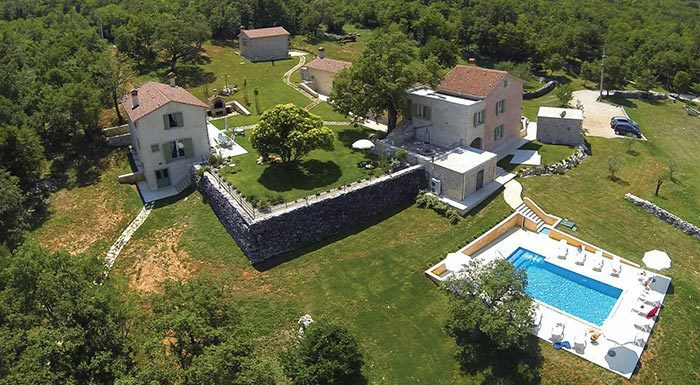 Below you'll find a couple of villas in Istria that we recommend. However, if you plan on renting a villa in Istria, you can head to our full post on villas in Istria. Ha! Full nepotism here, as we recommend our own villa in Istria first. We dedicated lots of love in making this house a perfect getaway for anybody seeking tranquility, privacy, and a place to recharge your energy. Our villa is set on a 1.000 m2 of landscaped land. It's lovely location, at the edge of a tiny village, gives our guests plenty of privacy, and peace and quiet. The two-story, three-bedroom, three-baths house is 170 m2 large. It features a fully-equipped kitchen, open space living and dining area, covered terrace with BBQ, tables, and chairs for dining al fresco, two patios, 24 m2 swimming pool, with sun-bathing area, and a pool house. It can accommodate up to 8 people. Located in a village of Fazana, within a walking distance from the sea, and also from the center of Fazana, this four-bedroom, four-baths villa belong to our friend Vedran. Villa Matija is set on a 1500 m2 of land. It features an outdoor pool, sauna, fully-equipped kitchen, open space living room with a fireplace. Pilato family, famous Istrian wine-makers, own and manage this stunning, 7-bedrooms, 6-baths villa. The property is set within a 800 m2 garden. It's fully-fenced, and surrounded by stone walls. The property can accommodated 14 people. It features fully-equipped kitchen, living room, few terraces, covered patio, laundry facilities, grassed sport pitch, BBQ, and 40 m2 swimming pool. Choice of villas in Split downtown is limited, however there are a couple of them we recommend down below. You'll find a larger choice of villas in the vicinity of Split, particularly in rural area around Imotski, and Omis, in neighboring coastal towns of Podstrana, Kastele, and Trogir, as well as on nearby islands of Solta, and Brac. Built over 100-years, villa Split is protected cultural monument, but also a stunning property to rent during your stay in Split. It's located in Meje, a posh neighborhood of Split, with lovely landscaped garden facing the sea. Almost every room in the house boasts wonderful sea views. It features 5 bedrooms, 3 full bathrooms, spacious living room fitted with designer furniture, and Murano chandeliers, modern kitchen with all amenities, and outdoor swimming pool. Check here for latest prices and availability. Villa Luminosa is a 2-bedrooms, 1-bath, 80 m2 villa, featuring open-plan living room, modern kitchen, and dining room with floor-to-ceiling windows. Outdoor area comprises of lovely landscaped garden with swimming pool and also BBQ facilities. The villa is only few minutes drive from the old town Split. This luxury villa is located in Podstrana, a seaside village just 10-minute drive from Split. Set on the hill, above the sea, the villa offers awesome sea views. It consists of three bedrooms, three bathrooms, open-air living and dining area, and fully-equipped kitchen, but also a gym. The outdoor area features a lovely patio, and infinity swimming pool. The location is also super tranquil, yet it's just minutes away from the center of Split. Hvar, Croatian island that attracts young, rich, and famous, indeed doesn't lack of luxury villas, and other top-notch accommodation. Surprisingly enough, you won't find the best luxury villas Hvar in Hvar Town, but rather in small, secluded villages scattered throughout the island; majority of whom you've probably never heard of. Below are few of our top picks. In a small village of Zablace, you'll find this beautifully restored traditional Hvar home, that accommodates max. of 6 people. The property consists of two separate houses; a three-story house featuring large kitchen on a ground floor, lovely living room on the first floor, and a master bedroom with en-suite bathroom on the top floor; but also a single-story house next door that features two additional bedrooms, each with en-suite bathroom. Outdoor area feature covered patio, BBQ, and a plunge pool. This property is seriously so well-restored, and beautiful. Inquire the owner about this property directly through OwnersDirect website. This traditional Hvar villa was recently restored to its full glory. 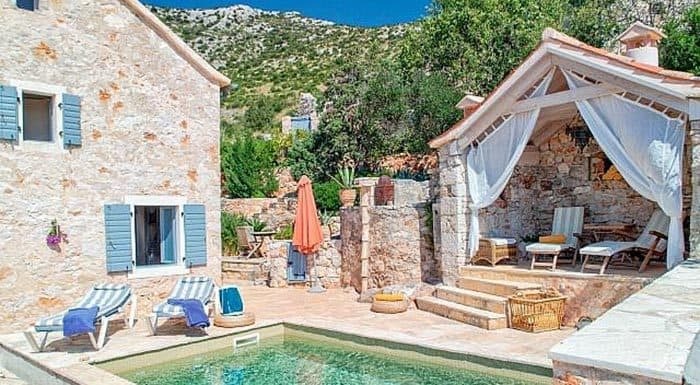 Despite its rural location, in the heart of Hvar island, and traditional looks, the villa features all modern cons a traveler might want: air-conditioner, WiFi, outdoor infinity pool, and a flat-screen TV. The house accommodates max of 10 people, in its 4-bedrooms, 4-bathrooms interior. It also features fully-equipped kitchen, beautiful living room with large window giving out to the Mediterranean garden, and even a tennis court. Check availability and latest prices. Villa Tana is a 4-bedroom, 3-bath house in a residential part of Jelsa, just stone's throw away from the sea. Interior is colorful with dark wood, bright yellow walls, and Spanish-style tiles in bathrooms. The villa also features an outdoor swimming pool, and it has a lovely garden. Villas in Dubrovnik come in all shapes, sizes, and styles. You'll also find modern villas at the outskirts of town, wonderful historical villas in the vicinity of old town, and traditional stone houses with lush gardens in villages of nearby Konavle region. Below we list some of our favorite villas in Dubrovnik. Built in 1930 by a wealthy Dubrovnik family, this stone villa features 5-bedrooms, 5-bathrooms, large, fully-equipped kitchen, living room, gym, sauna, and three terraces. It also features many original details from the time it was built. The villa is just 10-minute walk from the old town. Villa Marghareta is a modest family house in Dubrovnik, less than 2 km from the old town. While the old town is accessible by walk, bear in mind that villa is located on a hill, and it takes lots of steps to reach it. The best part of this property is its large garden, not so common feature for the properties within the town limits. The house consists of fully-equipped kitchen with dining area, three bedrooms, two bathrooms, a lovely garden, and an outdoor swimming pool. Check here for the latest prices and availability. This 4-bedroom, 3-bath villa is built into a hillside, in Lozica, a residential neighborhood north of Dubrovnik, less than 10-minute drive from the town. The villa stands directly above the sea, and it also has its own private beach. Interior is modern, with nautical theme throughout the house. The large terrace opens out to the sea offering lovely views over the nearby Elaphiti islands. We hope this post help you understand what to expect when renting villas in Croatia. If you have any question, suggestion, or just would like to drop us a line, please do so in the comments section below. By any chance do you know of any villas with 8 or more bedrooms? Love your website and would love to pick your brains re Croatia. My wife and i have never been but here’s what we’d ideally like from a Croatian holiday…..
We are going from the 6th October till the 18th and we will have a car. We’d like a lovely villa away from it all but within easy reach of nice small beaches , some Tavernas and some kind of town/village… maybe even Dubrovnik! We spend time in the villa but also love exploring by car and like swimming in the sea. We’v explored a lot of Greece and it’s islands but would love to discover more about Croatia . Also we’re aware it’s late in the season but would still want to eat out in Tavernas most evenings. Nothing too touristy Frank!! Also we do like visiting a big town/ city for shopping so maybe proximity to Dubrovnik would be good. What do you think? Probably our no 1 priority would be a great villa close to some nice small beaches that are good for swimming! … i know i know Frank ….. we want the earth but don’t know where to even start! Thankyou in advance for even taking the time to read all this ramble and looking forward to some advice. ps…….. what’s the weather like then? My grandparents came from the Slavonia…Slatina/Novaki /Cabuna region…are their any facilities and or tourism there? Do the people speak English there?? Slavonia isn’t very touristy, but in last years they started developing tourist offer, mostly through small family-run rural inns, and farm stays. Generally, people in Croatia, speak English, new generations perhaps as fluently as you and me :), but older people in Slavonia, less than people of the same age living along the coast.